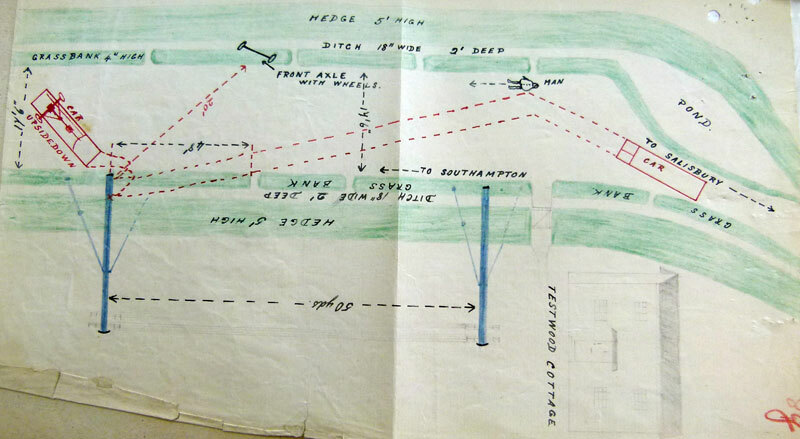 1915 Jun 7. General List. The undermentioned to be temporary Second Lieutenants. Ernest Claude Keevil. 1916 Jul 24. Hamps. .Reg .—Temp. 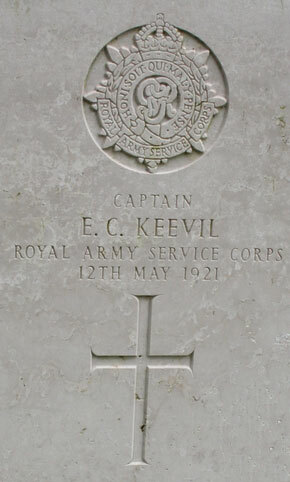 2nd Lt. E. C. Keevil, Wilts. R., relinquishes the rank of temp. Capt. on ceasing to comd. a T.F. 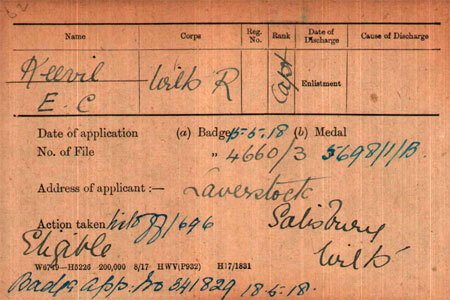 Co.
1918 Feb 12. Wilts. R.—Temp. Lt. E. C. Keevil relinquishes his commn. on account of ill-health contracted on active service, and is granted the hon. rank of Capt. 1919 Apr/Jun Daughter Sonia Mary Keevil born. 1921 Feb 1. "Permitted to resign"
1921 Apr 12. RASC Southern Comd. Res. (M.T.) Co. (D.F.). . To be temp. Capts. : — E. C. Keevil. 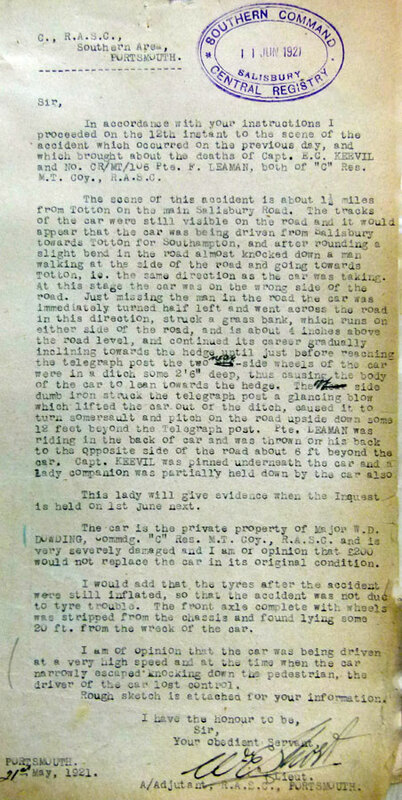 The resumed inquest showed that there were 3 in the car, apart from the 2 men who died , there was a Miss Golda Jacobs,. She said the Keevil was driving and that she was in the front passenger seat, but was unable to explain why her two shoes were wedged under the brake and clutch . 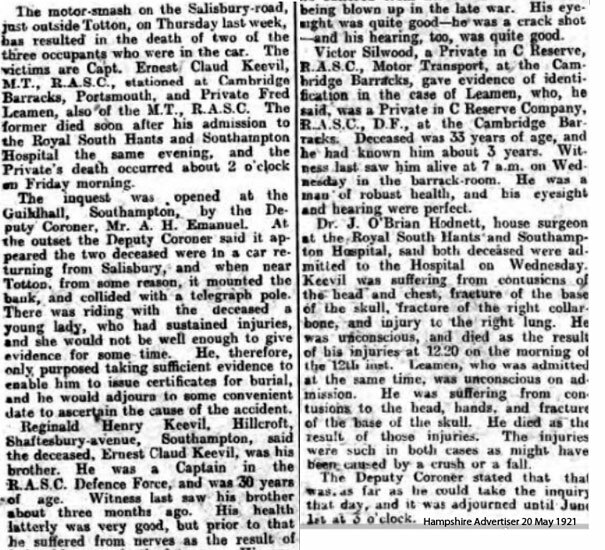 The suspicion was that she was driving and was not qualified, but the jury put it down to an accident as they could not tell who was driving.